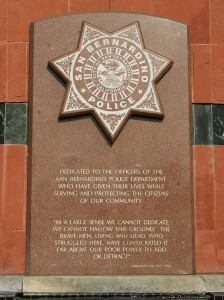 Dedicated to the officers of the San Bernardino Police Department who have given their lives while serving and protecting the citizens of our community. In a large sense we cannot dedicate, we cannot hallow this ground. The brave men, living and dead, who struggled here, have consecrated it far above our poor power to add or detract.